Welcome to the Converse Blog's Friday Flashback. 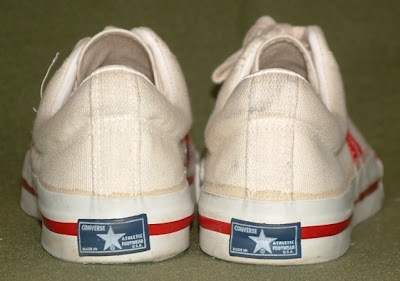 Today's post is a unique Canvas converse shoe from way back in the day. It features a two stripe pattern on the upper with a extra layer of Rubber with the V logo. It almost looks like an outrigger that you see on Converse shoes today. It has a strong looking rubber toe cap like you would find on Chucks. However, it features a sturdy extra ankle padding. Aside from the arrangement of the upper there isn't really anything I haven't seen in some form on a Converse shoe before. However, the outsole is where this shoe's uniqueness really shines. 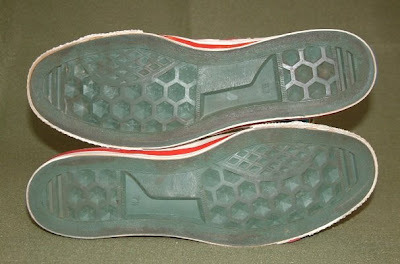 It features a honeycomb pattern, which is now mostly associated with Reebok. 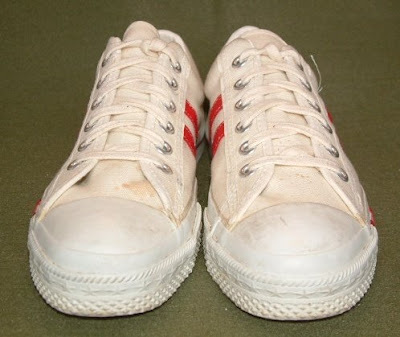 I think it would be safe to say that these shoes predate the existence of Reebok as a company. I don't know what any of that means, but I find it interesting. That's for checking out the blog, look for some interesting stuff around the corner.